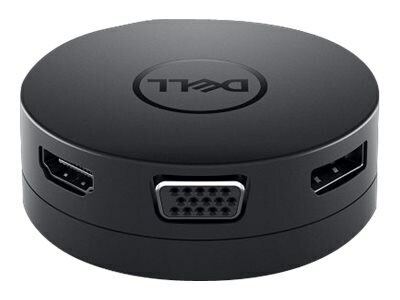 Featuring the widest variety of port options available, the Dell USB-C Mobile Adapter offers seamless video, network, and data connectivity, in a compact design. When adapter is connected to USB-C/Thunderbolt port (3A/5V) – two downstream USB-C and USB-A ports with USB3.1 Gen 2 file transfer rate up to 10Gbps is supported. When adapter is connected to a USB-C/Thunderbolt port (1.5A/5V) – only one of the two downstream USB-C and USB-A ports with USB2.0 file transfer rate up to 480Mbps is supported on a 1st come 1st serve basis (the peripheral connected first to either the USB-C or USB-A port is supported only). 2. HDMI and DisplayPort: 4K @ 60Hz available with PCs that support DP1.3 and above with 4K displays. 3. The round coaxial cable can be extended and retracted up to 9360 times. 4. PXE Boot – Pre eXecution Environment Boot allows a computer to be troubleshot remotely when connected to the network via its network card. 5. MAC address pass-through – MAC address pass through recognizes only a unique MAC address entered in the system’s BIOS (Basic Input/Output System) by overriding the adapter MAC address every time your laptop is connected to the network, ensuring that your PC’s MAC address stays the same no matter which USB-C adapter you use.